The last time I was in a room with so many birds — a pet shop with African Greys and budgies and the like — I had something of an anxiety attack. Many of them were free to roam at will, and some decided my shoulders would make a good roost. This time the closest thing to drawing blood came in a museum gift shop, where the sharp elbows of two Manhattan matrons kept jabbing me away from the bird postcards. The day was clear as glass, but cold, and we decided that we’d have better luck birdwatching at the New-York Historical Society than in Central Park. 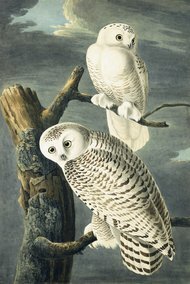 The museum is having the first show of three, together titled “The Complete Flock,” that will display all the museum’s unparalleled collection of John James Audubon. At the same time as it shows the watercolor models for the sumptuous double-elephant-folio print edition of The Birds of America (published between 1827 and 1838), it has something else special – early works that have rarely been seen, that show the development of the artist from a young age, when the naturalist was new to America and stoked about what he was seeing. He was new, and so was the turkey vulture he depicted in 1820, when Audubon was 35. 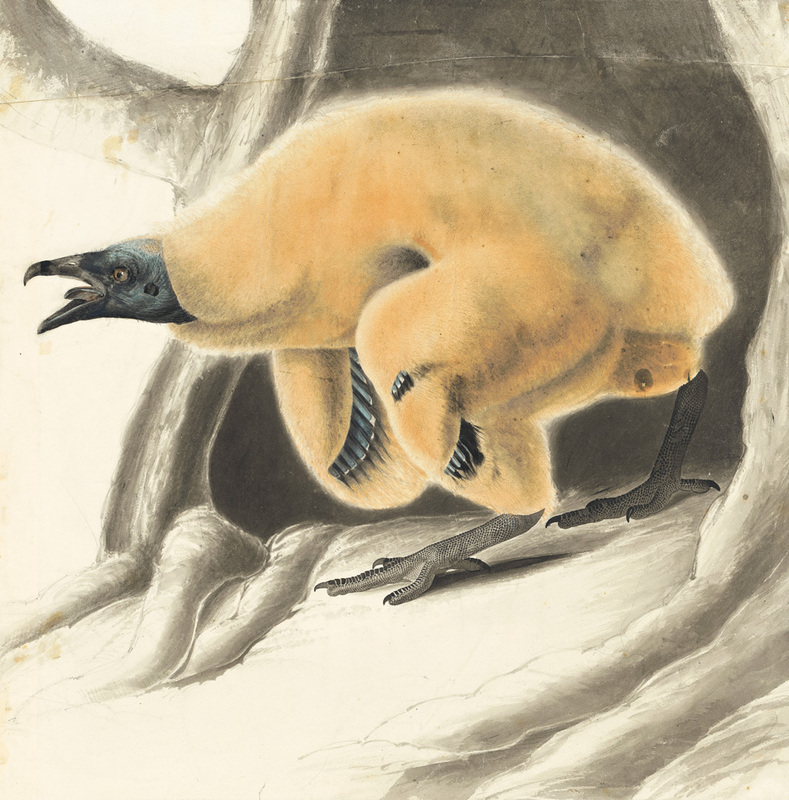 You can see the nestling’s downy feathers, rendered in pastel, and its leathery feet, drawn in black ink. Interesting creatures, they open their eyes immediately after hatching and in less than a week begin to move about in their dark cave. Lacking a syrinx, their vocalizations are limited to hisses and grunts. Within two weeks they become larger and more aggressive, and their black flight feathers begin to emerge, as Audubon shows with dreadful clarity. The adult turkey vulture has a six-foot wing span. 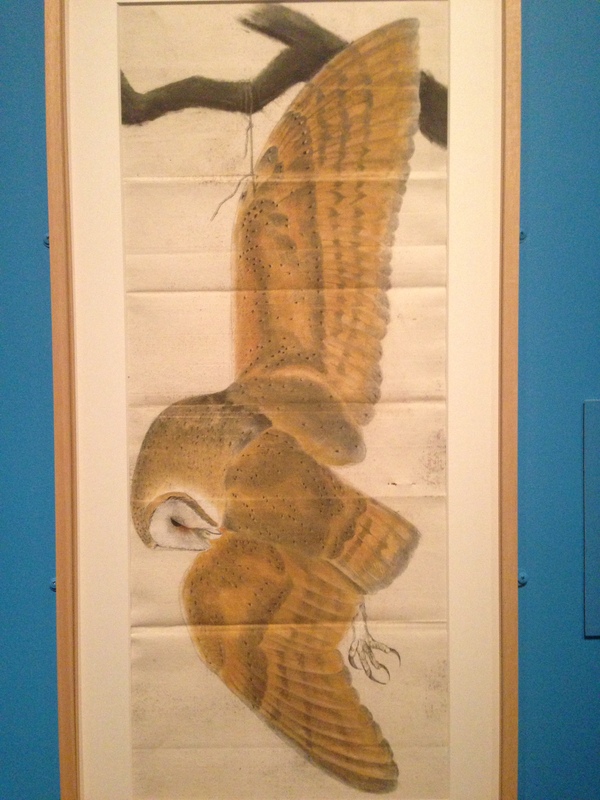 Also on display, a mechanism through which the young Audubon got the poses he wanted. He used something called a “position board” with horizontal and vertical lines, to which the bird was fixed with skewers and pins. None survive today but we have a verbal description of the specimens being impaled. This was an improvement over his earlier techniques, when he simply suspended a jay or a meadowlark by its beak and drew it that way, or a barn owl by its honey-colored wing. You can see the folds of the paper the artist used for this pastel. The great naturalist would kill 400 ducks to get the proper specimen. And when in the wild, he consumed his specimens for his supper. Bird calls are a thing you can’t describe in words. 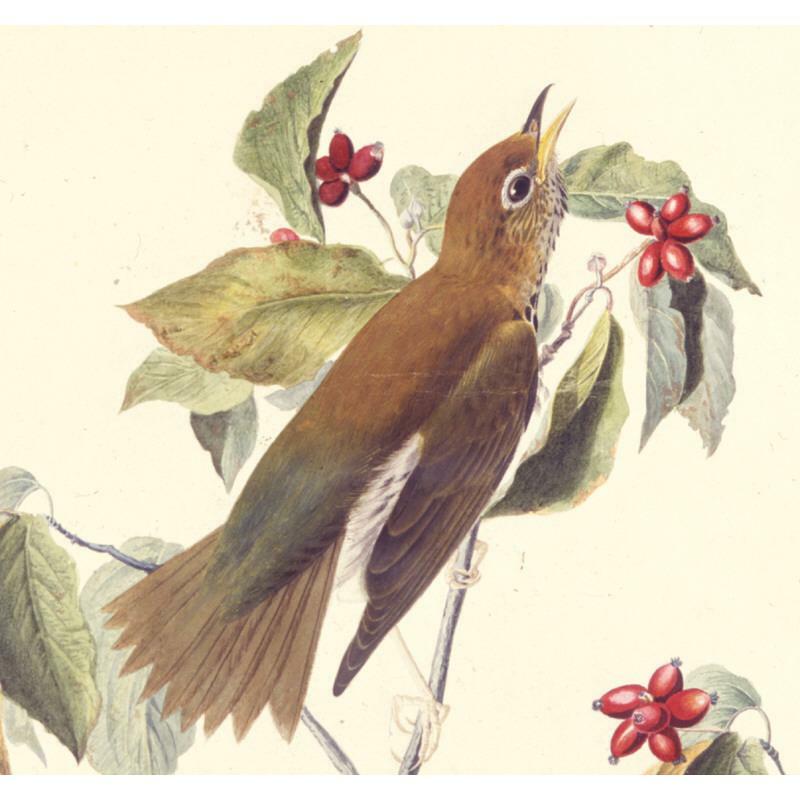 So I was glad there was a small device available that allowed visitors to hear the call of the wood thrush, so extolled in poetry. I loved the slightly nutty picture of house wrens nesting in an old faded hat, but appreciated it all the more because displayed alongside was the copperplate that had been used to make the print. After the plates came to America in 1839 they were stored at Minnie’s Land, Audubon’s estate on the Upper West Side of New York. Until in 1871 Lucy Bakewell, his widow, in desperate financial straits, sold most of them for scrap metal to the Ansonia Brass and Copper Company (the company, incidentally, owned by the Phelps family I wrote about in Love, Fiercely). Supposedly a teenaged son saved nearly a quarter of the plates from destruction. (Could it be Newton Stokes’ ancestor who made this smart move?) The New-York Historical Society owns four of the extant plates. 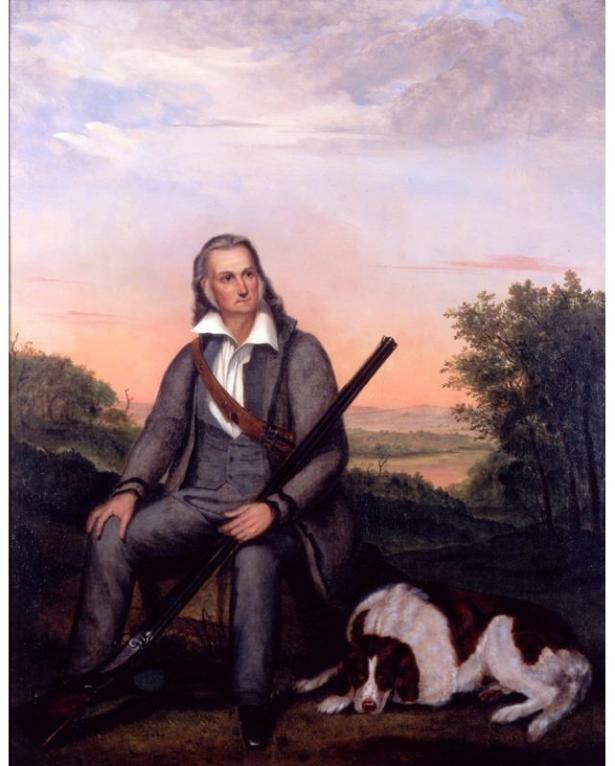 Audubon, we know, was suave, lean, a rock star of his time, his hair smoothed back with bear grease. Lucy, a Pre-Raphaelite beauty, liked to swim naked in rivers, and often went birding alongside her adventurous husband. They saw many crystal days together, and I bet they found some birds in Manhattan, too — before Central Park, back when New-York had a hyphen. The Central Park, as it was then called, did not open until 1857. Nice analysis – I was enlightened by the facts . Does anyone know where I would be able to acquire a sample CA EJ-150 form to type on ? Very interesting exhibit! 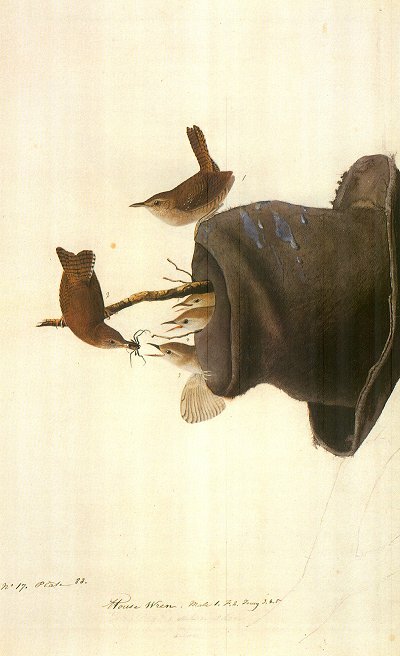 *Princeton Audubon Limited* reproduces the works of Audubon; I bought two, including the house wren, nesting in the hat, and foolishly cut them down to hang over my fireplace. I wish I had them now, though; I still have the smaller owl. So many memories of Audubon prints, the WONDERFUL prints which I bought, reproductions of the elephant prints. Later.